From the very beginning became interested in improvisation, popular and country music, which led to his natural purpose - jazz. Already in the music school began playing jazz at the piano in ensembles at holiday parties. At that time, in the Soviet Union there was no education in the field of jazz, and pupils playing with one another, often in the breaks between lessons , also learned as one another. The first notes for his jazz repertoire Nachum took to copying from your neighbor, restaurant pianist, which gradually began to replace some of his restaurant. History of jazz in the Soviet Union is quite different from its history in the West. All the information soviet musicians fell through radio stations such as “Voice of America ” , " Liberty”," Radio Nord” , "Freheitsende 904", etc ; in the form of music programs that were recorded on tape. These records are in fact became the first jazz education for Nachum. In Riga , has created a " jazz clique", which became part and Nachum Pereferkovich - while as the only pianist. A year before his military service Nahum began independently to learn to play the clarinet- no saxophone , because in Soviet Union in that times a saxophone cost like 13 monthly salaries of the engineer - who was his father. Clarinet Nachum played - and played so far - only New Orleans style. 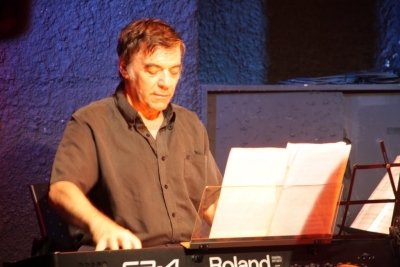 After returning from the military service in 1968, Nahum came to continue his studies at the Academy on viola, and parallel joined as a pianist, one of the leading Latvian jazz quartets. .With this ensemble Nachum Pereferkovich performed at major jazz festivals in the Soviet Union - until he left to Israel . In 1970 he became acquainted with the melodica when heard Jack DeJohnette play on it; and made for first time in the USSR some jazz recordings in the USSR on this instrument. After arriving to Israel, Nahum immediately began working in the Jerusalem symphony orchestra of Radio and TV, and joined in parallel to the leading Israel fusion group The Platina, which is headed by the outstanding saxophonist and composer, also former soviet musician Roman Kunsman. As part of Platina Nachum in 1974 participated in the Newport Jazz Festival in 1974 . Already in 1973, Nahum was the first test performances with great blues artists Memphis Slim. Nahum Pereferkovich performs regularly at leading jazz festivals in Israel.